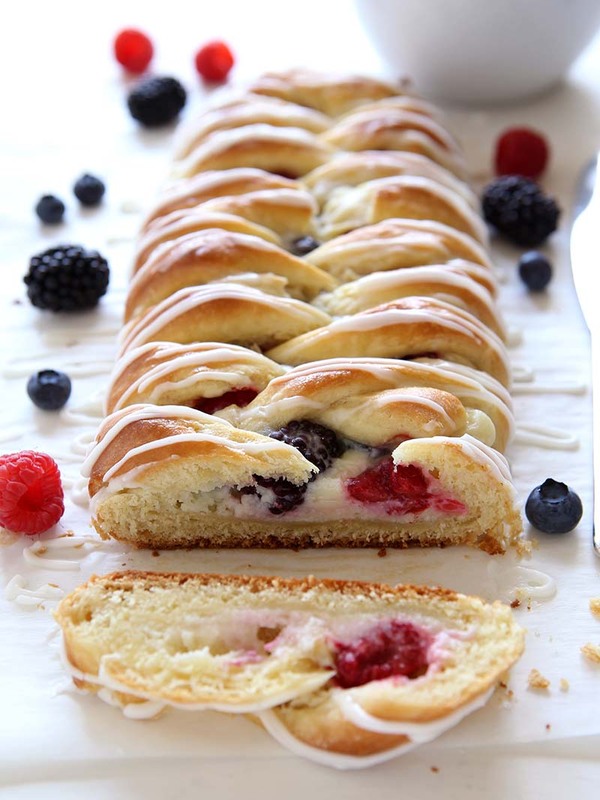 Sweet and buttery homemade danish pastry filled with cream cheese and fresh summer berries. Combine the warm milk and yeast and stir slightly to combine. Let sit for 5-10 minutes. Meanwhile, combine the flour, sugar and salt in a large bowl. Add the butter and cut it into the dry ingredients with a pastry blender until the butter is the size of small peas. Whisk together the yeast mixture and the egg yolks and add all at once to the flour mixture. Stir with a wooden spoon just until it forms a sticky dough. Do not knead. Cover with plastic wrap and chill for at least 2 hours. Dump the chilled dough onto a floured surface and roll it into a large rectangle about 15 inches wide. Fold the dough in thirds like you would a business letter, then roll it out again. Repeat 2 more times. Fold the dough in thirds again and cover with plastic wrap. Chill for at least 30 minutes and up to 3 days, or freeze for up to 1 month. Cut chilled dough in half and roll each out into an approximate 12x6-inch rectangle. Transfer to 2 sheet pans lined with parchment paper. Use a knife to score each rectangle into thirds lengthwise. Cut the outer thirds into 1-inch strips. With either a mixer or by hand, beat the cream cheese, sugar and egg until smooth. Spread into the center of each dough rectangle. Top with berries or desired fruit. To make a braid, take one top dough stip and fold it over the filling. Fold the dough strip from the other side over the top, overlapping the first one slightly. Repeat all the way down. Cover with plastic wrap and let rise for about 30 minutes. Meanwhile, preheat oven to 400°F. Brush with egg wash and bake until crust is golden about, about 30 minutes. Let cool to room temperature. Whisk together the powdered sugar and milk or cream until smooth. Drizzle over the cooled danish braid. Serve and enjoy! This recipe makes two danish braids, but if desired the dough for the second braid can be stored in the fridge for up to 3 days or in the freezer for up to 1 month. Thaw before proceeding with the recipe. Do you think this recipe could be done using almond flour? Hi Victoria – This recipe was developed using all-purpose flour, which contains gluten. Because almond flour doesn’t contain gluten, it would not work with a one-to-one substitution in this recipe. You may like to try our Gluten Free Blueberry Coffee Cake or other gluten-free recipes >> https://redstaryeast.com/recipes/gluten-free-recipes/.